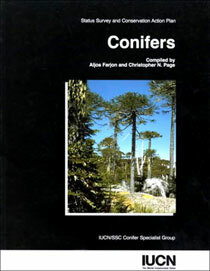 Conifers are one of the world's most important resources of timber. If managed wisely and used sustainably, these resources will provide wood for a multitude of purposes, virtually indefinitely. Additional products include resins and their derivatives, and even medicinal extracts--for example taxol now used in the treatment of cancer. Conifers occur on all continents except Antarctica. Of the 630 species, 355 are listed as of conservation concern, with 200, or 25 of species, threatened with extinction. Although exploitation of these resources is as old as civilization, this century has seen a dramatic increase in the exploitation of timber resources. This action plan assess conifer diversity and its threats. It is unique among IUCN's Plant Action Plans so far published, in that it gives the complete global red list of conifers using the 1994 IUCN Red List Categories and criteria. Data is analyzed to identify "conifer hot spots", where conservation should be a priority, and a short-list of threatened species is prioritized.